Nothing is worth sacrificing our relationship with the true Lover of our soul. 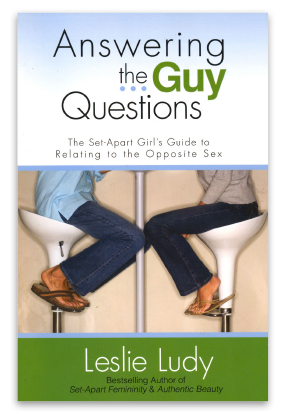 Answering the Guy Questions is a powerful book that tackles some of the toughest relationship questions young women ask. If you have ever been discouraged, disgusted, depressed, or even defeated by the state of modern guys, this book can infuse you with vision, hope, and a practical means of doing something about it! Rather than follow the world's plan to capture the attention of the man of your dreams, allow Leslie to challenge you to live a set apart life and develop a Christ-consumed heart. This is a great book for small group discussions and is appropriate for younger teens while still relevant for women college-aged and older.